After some delay, we are finally ready for our first release this summer. It may be only a digital single but it is a HEAVY one. The Infiammati Dub project was born back in 2012 in southern Italy and since then it evolved into a heavyweight soundsystem touring the land and spreading the positive vibrations alongside many of the most known soundsystems of the country and participating in many dub festivals. Their sound is majestic and every time they drop a tune its like a warrior gathering. 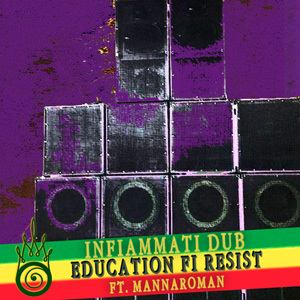 "Education Fi Resist" features the chanting of Mannaroman and will be released in two different cuts on the 1st of July 2016. Are you ready?